Jeff and Frankie Callum (Patrick Allen and Sarah Lawson) run the Swan, an inn and tavern on the remote Scottish island of Fara. Jeff, a novelist in his spare time, hires a secretary named Angela Roberts (Jane Merrow). Unknown to Frankie, Jeff and Angela are former lovers. Meanwhile Fara Island is experiencing a stifling heat wave in November, with temperatures in the 90's and rising daily. It has become so hot that cars stall, beer bottles shatter, televisions explode and telephones have ceased to work. 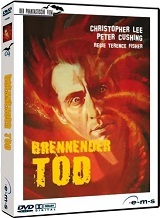 Also stars Christopher Lee and Peter Cushing. With English and German language options. Widescreen format.